NEW YORK (CNS) — High school football players battle racism on and off the field in “Woodlawn” (Pure Flix), an entertaining and inspirational film that’s appropriate for most age groups. Based on the true story of star running back Tony Nathan (Caleb Castille), who went on to play for the University of Alabama and the Miami Dolphins, “Woodlawn” demonstrates to young and old alike that, with God and family on your side, nothing is impossible — including, in this instance, a winning record. The setting is racially torn 1973 Birmingham, Alabama, a veritable war zone of riots and cross burnings. With the implementation of court-mandated desegregation in public schools, 500 black students arrive by bus to join their 2,000 white peers at Woodlawn High. Tensions flare, especially on the sports field, where athletically gifted newcomer Tony literally runs away with the ball, earning him the nickname “Touchdown Tony.” This incites jealousy among his white teammates and fellow students. Supporting Tony are his loving parents, Louise (Sherri Shepherd) and Junior (Lance Nichols). 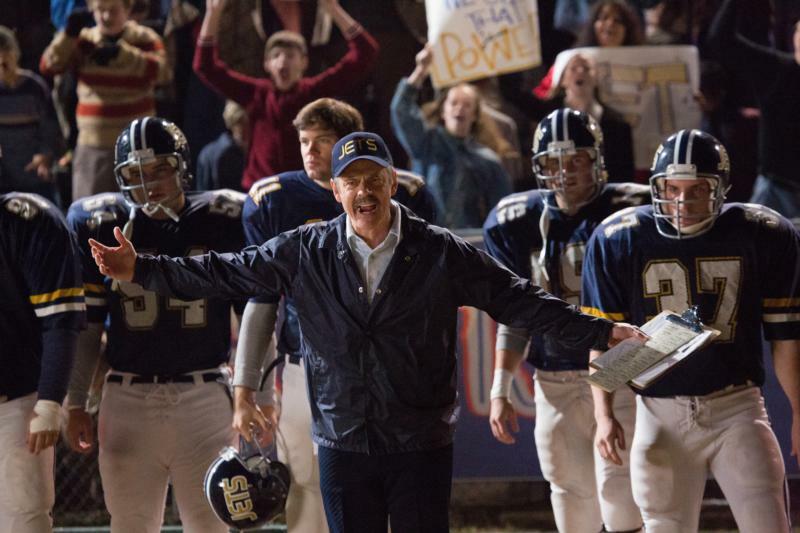 On the sidelines is legendary Alabama coach Paul “Bear” Bryant (Jon Voight), who knows a superstar in the making when he sees one. Woodlawn’s own no-nonsense coach, Tandy Gerelds (Nic Bishop), just wants to win games. At a loss about how to reconcile his players to the new paradigm of integration, he reluctantly agrees to let a “sports chaplain” address the squad. Enter Hank (Sean Astin), an outsider with a mission. Fired up after attending a Billy Graham crusade, Hank issues a direct challenge to the players. Within minutes, a “miracle” happens: Tony and 40 fellow players, black and white, step forward and pledge themselves to the “better way” through living the Gospel message. As improbable as it sounds, that’s apparently how it unfolded in real life. Change rippled through the school and out into the community and even affected rival teams. It isn’t long before an initially skeptical Coach Gerelds asks to be baptized. Needless to say, such religious activity does not go down well with the local school board — who are obligated to maintain the constitutional borderline between church and state. Among other things, Coach Gerelds is ordered to stop the communal pregame recitation of the Our Father. But such measures fail to undermine the positive new atmosphere, and Woodlawn rolls on to an unprecedented winning streak. Brother directors Andrew and Jon Erwin — Jon co-wrote the script with Quinton Peeples — prove skillful at juggling complex football action with quieter moments in church. Although they approach their narrative from an evangelical perspective, their themes of faith, reconciliation and social justice will, of course, resonate with Catholic moviegoers. The film contains scenes of mild racial violence and aggressive football action. The Catholic News Service classification is A-II — adults and adolescents. The Motion Picture Association of America rating is PG — parental guidance suggested. Some material may not be suitable for children.